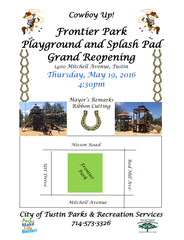 Cowboy up for the Frontier Park playground and splash pad grand reopening tomorrow, Thursday, May 19, 2016 at 4:30 pm (1400 Mitchell Ave, Tustin). There will be a ribbon cutting ceremony followed by refreshments. Please come out and support your park alongside the Mayor, the City of Tustin Parks and Recreation Department, and the Tustin Police Department!